US, 1976, 88 minutes, Colour. From archival footage: Milton Berle, Dwight D. Eisenhower, Hitler, Bob Hope, Joseph P. Kennedy, Charles A. Lindbergh, Douglas MacArthur, Benito Mussolini, Eleanor Roosevelt, Franklin Delano Roosevelt, Josef Stalin. All This and World War II is a creative documentary. It uses a considerable amount of archival footage of World War II. It is interesting in its perspective on Hitler, Stalin, Mussolini as well as the Americans who opposed them. The particular thing about the film is that it uses Beatles songs as background to the documentary footage. The Beatles then become a mouthpiece for interpreting aspects of 20th century history. Examples of the songs include ‘Fool on the Hill’, sung by Helen Reddy, with images of Hitler relaxing at his holiday hideout. ‘Get Back’ is sung by Rod Stewart while we watch Nazi troops and their marching with their goose-step style. 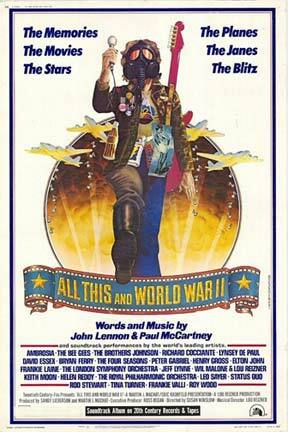 There is aerial battle with ‘Lucy in the Sky with Diamonds’, the harshness of war with ‘The Long and Winding Road’. ‘Help’, ‘Let it Be’ and other songs, of course, also make their comment. The film climaxes with the atomic bomb exploding and the overlay of ‘Give Peace a Chance’. The film is a perspective on World War II thirty years after the event. It takes on historic significance as the decades pass and also the reputation of the Beatles increases. A cinematic oddity – but intriguing. I. The meaning and tone of the title, the overtones of song? The originality of the conception of this war documentary? The light tone, the serious tone? 2. The impact of the film as an audiovisual experience, the creating of an impression of the war rather than for deep understanding and insight? The effect of such a collage? the criteria for the inclusion of material, exclusion? The songs distancing the audience from the experience they were watching? The blending of the songs and the sound effects? What presuppositions about the war did it have? For what audience? How much knowledge needed? The effect of this hour and a half exposure to an impression of the war? 3. The importance of the editing techniques? The criteria for choice of material for the point of view of the seventies? Documentary footage, newsreels? The use of film clips and not distinguishing these from documentary? The use of films made twenty five years after the end of the war such as Tora Tora Tora and Patton? The emphasis of the film on cinema and film stars, for example James Stewart? Did this add to the realism of the film? Did it detract form the realism? From what point of view was the documentary made? The editing point of view, for example about America and its being unready to enter the war? The importance of the ending with just the image of the atomic bomb and the song, Give Peace a Chance? 4. How appropriate were the Beatle's songs for this kind of audiovisual experience? What attracted the film-makers towards the Beatle's songs, their lyrics? The importance of the different singers, modern popular singers for presenting the songs? The presentation of the songs, their appropriateness for particular parts? 5. Comment on the themes of the songs, for example Hitler and the Fool on the Hill, Mussolini and the Nowhere Man, Michelle and the warring crowds, Hitler and Get Back, aerial battle and Lucy In the Sky with Diamonds, the hardness of war and the Long and Winding Road, Help, Let It Be etc? Clips from the songs? For an audience not familiar with the Beatles songs? 6. The film had a particular American emphasis. Was it a bias? The proportion of attention given to the war in Europe, Britains' role, the presentation of Hitler in Germany? The presentation of America prior to Pearl Harbour, Pearl Harbour, the war in the Pacific? Americans in Europe? The E Day and the end of the war in the Pacific? Did it over emphasise the role of America? What would be the impression of someone unfamiliar with the wide range of World War II? 7. The humour of the introduction, the focus on twentieth century Fox film clips? What tone did it give? How did this tone remain? A change of tone with Give Peace a Chance at the end? 8. How well did the film introduce the situation of the world in 1938 with Munich? The build-up of Hitler, Nazi Germany? The unprepared ness of Europe, for example France? Declaration of war? The use of documents, newspaper headlines, interviews with real people, using the films of the time, for example Humphrey Bogart and his comment from Casablanca, the long patriotic speech by Dana Andrews in The Purple Heart? England, Europe? The battle of Britain? The focus on Rommel and the clips of The Desert Rats and finally from The Desert Fox? 9. The impression of America before the war? The contrast with Japanese preparations and Americans enjoying themselves? The pathos of the round up of American Japanese? Pearl Harbour? 10. How well did the film illustrate the Pacific War, Midway etc? 11. The presentation of D Day, American Involvement? The effect on Europe and the end of the war? 12. The contrast with the final months of the war in the Pacific? The ticker tape ending and the irony of the bomb? 13. How much insight into history via such an audiovisual experience?